His colleague replied, ‘We’re both using Etoposide, Platinum, Oncovin, and Hydroxyurea. You call yours EPOH. I tell my patients I’m giving them HOPE. As dismal as the statistics are, I emphasize that we have a chance.” From William M. Buchholz, M.D., Chicken Soup for the Surviving Soul. Dopamine is Like a Roux in Cajun Food: A roux is a mixture of flour and fat (usually butter or oil). A roux is the basis for many Louisiana Cajun dishes, including: gumbo, etouffée, sauce piquante, and more. Without a proper roux, the gumbo is weak, listless, and without form. Likewise, loss of dopamine in Parkinson’s leads to slowness of voluntary movements, decreased facial expression, shuffling gait with reduced arm swing, and poor balance. Thus, the absence of either dopamine in Parkinson’s or a roux in gumbo gives less then perfect results. In Parkinson’s, we try very hard to replace the dopamine we’re missing: we use a dopamine agonist as a mimic; we take levodopa (with carbidopa) and it is converted to dopamine; and we take drugs/supplements in an attempt to preserve the dopamine we still make. Dopamine, it is all about supply and demand. The Tale of Dopamine: In 1817, Dr. James Parkinson published “An Essay On The Shaking Palsy”, which was first medical document to describe Parkinson’s (http://perspectivesinmedicine.cshlp.org/content/1/1/a008862.full). Jump ahead 140 years to 1957, Dr. Arvid Carlsson demonstrated that dopamine was a brain neurotransmitter. His laboratory then found that depletion of dopamine promoted a loss of movement control. Furthermore, he reported that the precursor to dopamine, L-DOPA, alleviated some of the symptoms of Parkinson’s (http://www.ncbi.nlm.nih.gov/pmc/articles/PMC2824994/ and http://link.springer.com/chapter/10.1007%2F978-3-211-45295-0_3). For all of these achievements, the Nobel Prize in Physiology or Medicine was given to Dr. Carlsson in 2000. Dopamine and Brain Chemistry 101 [*terms/words further defined at the bottom]: What actually is this substance called dopamine? How is dopamine made in the brain (all of the steps are in the below figure but not all will be described here)? Dopamine is classified as a neurotransmitter, and it is found mostly in the central nervous system. The amino acid tyrosine, usually derived from dietary proteins, enters the brain in the circulating blood. Tyrosine is taken up into catecholamine neurons by amino acid transporters in the brain. The conversion of tyrosine to dihydroxyphenylalanine (L-DOPA) is catalyzed by the enzyme tyrosine hydroxylase. L-DOPA is converted to dopamine by the enzyme DOPA decarboxylase. This enzyme so quickly changes L-DOPA to dopamine, that supplying the enzyme (DOPA decarboxylase) with additional substrate (L-DOPA) leads to increased product formation (dopamine), which is the basis of L-DOPA treatment for Parkinson’s. There are 5 different dopamine receptors (D1, D2, D3, D4, and D5) that provide for all of the physiological functions of the neurotransmitter dopamine, and how dopamine works will be described in the future (for a beautiful review of dopamine signaling, go here: http://pharmrev.aspetjournals.org/content/63/1/182.full). Dopamine as a Symbol of Hope: Although Parkinson’s was 1st described clinically ~200 years ago, we really do not fully understand the entire clinical or biochemical portrait. However, we are united by dopamine, regardless of the stage of Parkinson’s. Thriving with Parkinson’s demands that you stay positive and remain hopeful. In many ways, dopamine is very meaningful and symbolic of hope. 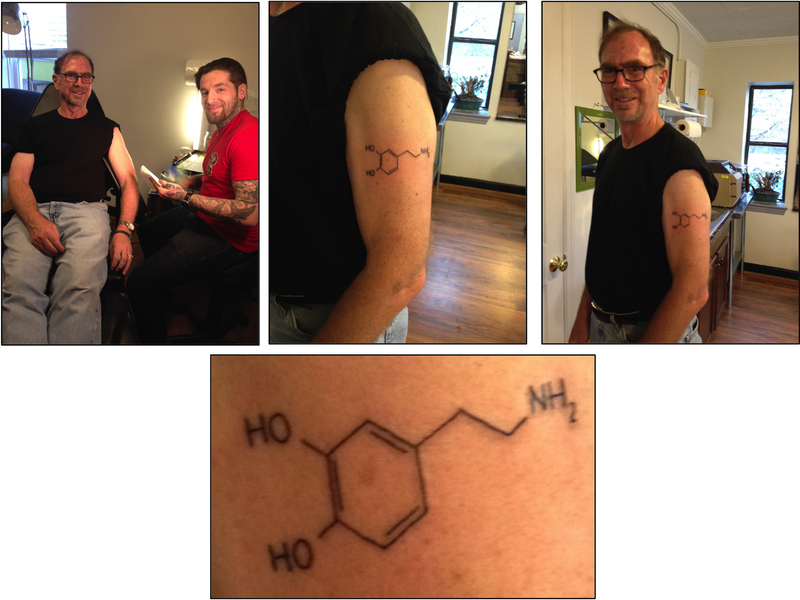 I now have a dopamine tattoo (I’ll always be a science geek!). To me, the structure of dopamine on my arm is a meaningful symbol of hope. 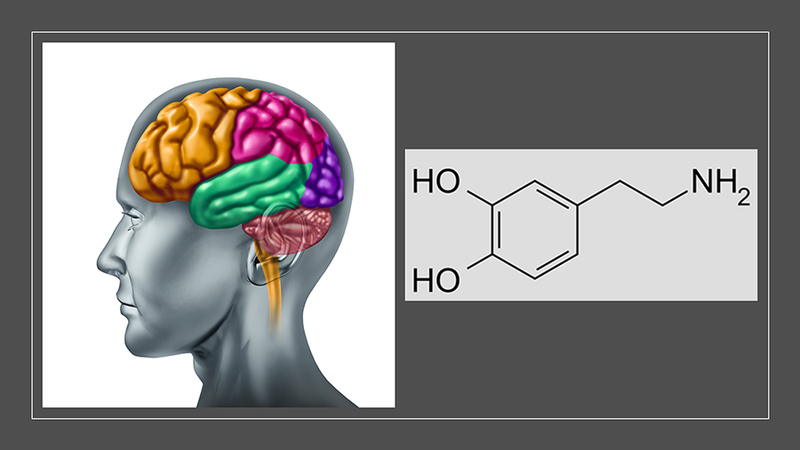 [*Dopamine (chemical name 3,4-dihydroxyphenethylamine) is a neurotransmitter of the catecholamine and phenethylamine families that plays a number of important roles in the human brain and body. Its name derives from its chemical structure: it is an amine that is formed by removing a carboxyl group from a molecule of L-DOPA (modified from http://en.wikipedia.org/wiki/Dopamine); neurotransmitters are endogenous substances that transmit signals across a synapse from one neuron to another “target” neuron or to another nerve fiber, a muscle fiber, or some other structure; amino acids contain an amino group (NH2), a carboxylic acid group (COOH), and a distinctive side chain, especially any of the 20 amino acids that link together to form proteins. Some amino acids (called nonessential) can be synthesized in the human body, while others (called essential) must be obtained through the diet (http://www.thefreedictionary.com/amino+acid); enzymes are proteins that acts as a catalyst to bring about a specific biochemical reaction (converting substrate to product). Love the tat, that’s awesome! I love that tattoo!!! Looks good on you Frank! I love your tattoo!! Once a science geek, always a science geek!!! I want a dopamine molecule tee- shirt with “HOPE”across the top!! Wow! Nice tatoo! 🙂 Have you never heard about neurogical music therapy? I will look into it and write about it, thanks for the suggestion/question.